Neuroscientists at the University of Virginia have made one of the biggest scientific discoveries of 2015: The brain is connected to the immune system. Led by neuroscience professor Jonathan Kipnis, who also serves as director of the Center for Brain Immunology and Glia, UVA researchers discovered previously unknown blood vessels lying beneath a mouse’s skull, linking the brain and the immune system. These vessels may help to explain the cause and effect of many neurological diseases such as autism and Alzheimer’s. The discovery will certainly change the way that scientists approach their study of the immune system as it relates to mental health. The newly discovered vessels run through the meninges, a membrane that envelops the brain and the spinal cord. They’d likely been overlooked, Kipnis says, because the meninges is typically considered the packaging that protects the brain rather than being thought of as its own important piece of the anatomical puzzle containing important vessels. In their study, published in Nature in June, the UVA scientists explain and illustrate their findings, which will change medical textbooks going forward. The team made its discovery after developing a way to mount a mouse’s meninges so it could be examined as a whole on a single slide. On the slides, they saw vessellike patterns in the distribution of the immune cells. 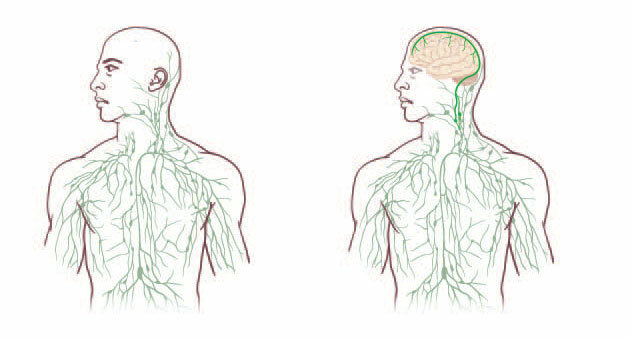 They then tested to see if they were looking at lymphatic vessels that serve the cerebral spinal fluid—and they were. While formal tests have yet to be conducted on humans, preliminary experiments suggest the anatomy is the same. “We’re pretty confident that they’re there in humans as well,” Kipnis says. The author refers to “unknown blood vessels” early in the article, but I believe the correct identification is lymphatic system vessels. The circulatory system isn’t part of the discover according to the rest of the article. My grandson was progressing like all infants until his 1st birthday, when he contracted a very very bad cold. He was given a very strong antibiotic, and from that point we noticed a regression in his speech and emotional activity. I can see where this antibiotic may have followed the course of the blood vessels to his brain, and possibly had a deleterious effect, either causing, or acerbating a cloaked condition. Massive therapy is helping, but he is till (at the age of 4), a good year and a half behind normal, and we are not sure he will ever be able to function in what we consider normality.